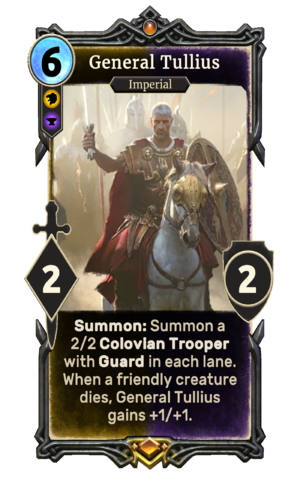 Summon: Summon a 2/2 Colovian Trooper with Guard in each lane. When a friendly creature dies, General Tullius gains +1/+1. General Tullius is a unique legendary Spellsword creature card. It is part of the Core Set. "Time to overcome my evil nature!" "I won't fail in my duty!" This card's ability applies the Glory of the Empire card effect. General Tullius first appeared in Skyrim. This page was last modified on 16 February 2019, at 15:48.